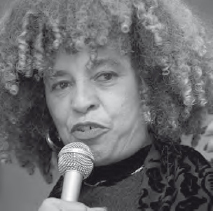 Angela Davis (1944–) is a world-famous African American social critic and political activist. In 1970, she was acting assistant professor in the philosophy department at the University of California, Los Angeles, and a member of the Communist Party USA. She was also once associated with the Black Panther Party. Davis was criminally indicted for helping Black Panther member George Jackson to escape from a courtroom in Marin County, California, in 1970. The guns Jackson used were registered in Angela Davis’ name. She was for a while on the FBI’s most wanted list after she fled arrest. In the end, Davis was acquitted of criminal charges and was rehired at the university. Davis claimed that she never completed her dissertation because it was “lost” in papers confiscated by the FBI. She has since developed a distinguished career in critical writings about race and gender as well as the “prison industrial complex” in contemporary American culture. Davis’ principal works include If They Come in the Morning: Voices of Resistance (1971), Frame Up: The Opening Defense Statement Made (1972), Angela Davis: An Autobiography (1974), Women, Race and Class (1981), Violence against Women and the Ongoing Challenge to Racism (1985), Women, Culture and Politics (1989), Blues Legacies and Black Feminism: Gertrude “Ma” Rainey, Bessie Smith, and Billie Holiday (1999), Are Prisons Obsolete? (2003), and Abolition Democracy: Beyond Prisons, Torture, and Empire (2005). African American social critic and political activist Angela Davis has remained relevant since the 1970s by continuing to write on race and gender issues (AP).